Real estate investment trusts (REIT) is a class of stock investment that many believe are very much affected by global interest rate changes. For the past 35 years, the world have been in an environment where interest rate is getting lower and lower. There are periods where interest rate do rose, however the trend is down. For the past 5 years, there have been on and off voices that warns us that interest rate is about to rise. Bonds, which are interest rate sensitive, and pseudo-bond like instruments such as MLPs, REITs, business trusts, highly leveraged stocks, utilities are not going to fare well. REITs take on debt financing to improve their return, and managers optimize their structure to balance between boosting returns versus credit risk. When REITs take on debt, they usually pay interest only expense (without returning the principal) as the cost of using the debt. This interest expense reduces the eventual cash flow that is available to pay the REIT shareholders. Thus the more the debt, the higher the interest expense. When market interest rate rise, the cost of borrowing the same amount of debt rises. Thus there will be less cash flow to pay shareholder their dividends, dividend yield will be lesser. This is likely to affect the share price. Conversely, if market interest rate fall, the cost of borrowing the same amount of debt fall. Thus there will be more cash flow to pay shareholder their dividends, and dividend yield will be higher. The second effect is related to REIT when competing for investor’s attention. We are always looking for the highest expected return we can get for the lowest risk. REITs will compete with risk free government bonds, stocks, properties, corporate bonds, insurance plans for your capital. 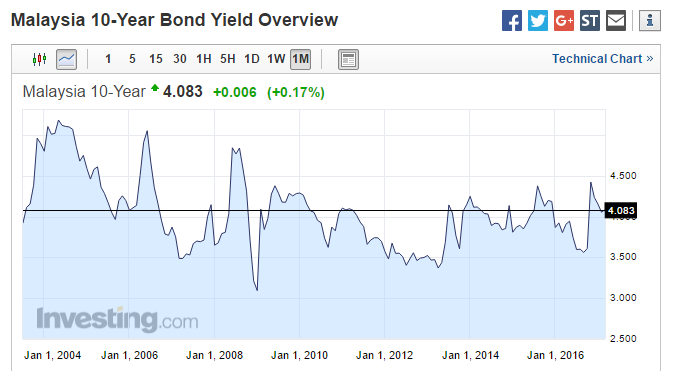 Thus, when market interest rate rises, the interest yield on risk free government bonds, for example rises. The risk free government bonds become more attractive, when adjusted for risk, versus other investment assets such as REITs. All else being equal, the REITs value should fall. The reverse is true as well when the interest rate fall. The infographic above tries to illustrate the relationship. The risk free government bonds is represented by the 10 year SGS bonds. We will see how an industrial REIT with 40 year land lease react, when interest rate changes. In #1, there is a 3.5% premium spread between the dividend yield of the industrial REIT and the risk free government bonds. In #2, when the risk free government bond yield rose from 2.5% to 3.5%, to have that same 3.5% premium spread between the 2 assets, all else being equal, the price of the industrial REIT needs to fall from $1.69 to $1.42 (16% capital loss), so that the dividend yield grows from 6% to 7%, where the 3.5% premium spread is maintained. In #3, the difference between this scenario and #2 is that the dividend per share was able to grow 18%. Due to that, the dividend yield organically grow from 6% to 7%. This maintains the premium spread of 3.5%. The share price theoretically do not need to adjust downwards. Scenario #3 can occur, when interest rate rises and the rent of the underlying properties in the industrial REIT is able to increase. Scenario #2 is not favorable to an existing REIT holder while #3 is favorable to him. From the previous section, we see a close relationship between REIT performance and the 10 year government bond rates. The 10 year government bond rates change as a function of demand and supply. And its demand and supply change, usually due to the policies directed by the Monetary authority in various countries. These will be the Central Banks around the world. Most countries follow the Keynesian school of economics, where economic and business cycles are counter balance by the monetary authority / central banks shifting of short term interest rates. When a country’s economy is overheating, the authority increase the interest rates. This increases the borrowing cost of doing business, which tightens up the economy. When a country’s economy is underwhelming, the authority reduces the interest rates. This decreases the borrowing cost of doing business, which stimulates the economy. This becomes a cycle which repeats when the economy is doing well, the authority such as the USA Central Bank starts tightening or increasing the market interest rate. Initially, when the economy is easy, the tightening is conducive for business. However the economy eventually becomes tighter, and further tightening will eventually bring the economy to slow down. During slow down, the authority may start stimulating the economy by reducing the market interest rate. 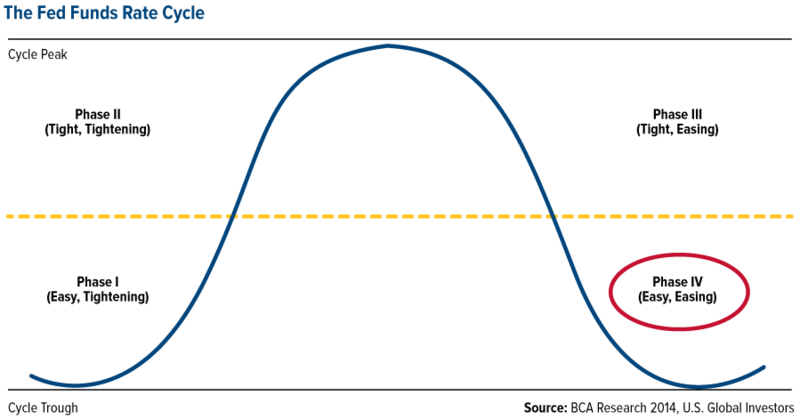 If we look at the Feds Fund Rate Cycle, Phase I and Phase IV are favorable for the REITs. In Phase I, even when the cost of borrowing is rising, the market is still expanding. Production capacity can increase, GDP will improve, demand for goods and services increases, and more supporting infrastructure is necessary. Given a fixed supply, higher demand commands higher rentals. In Phase IV, majority of the challenging economic outlook have worked itself out. The cheaper borrowing cost will eventually prove to be conducive for the properties. Phase II is not conducive for the REITs because future projected GDP, demand for jobs are limited. When borrowing costs increases, the REIT managers cannot raise rent like they could in Phase I to offset the higher borrowing cost. This may tip the REIT over negatively. Does this Theoretical REIT Interest Rate Relationship always Hold True? The relationship do not always work out so clearly. The REIT market in Singapore is very young and we do not have so much data to work with, however, we have more data in a matured property market such as the USA. 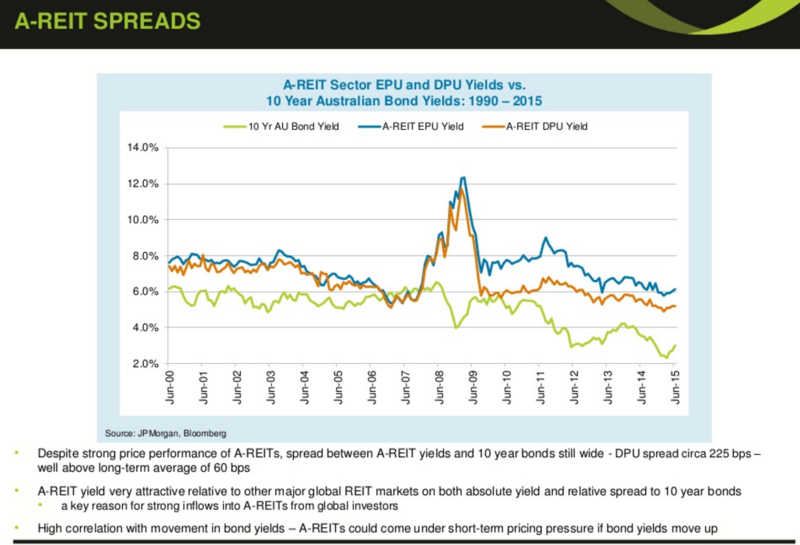 Pension Partners published an interesting article looking at the REIT performance versus the 10 Year interest rate. 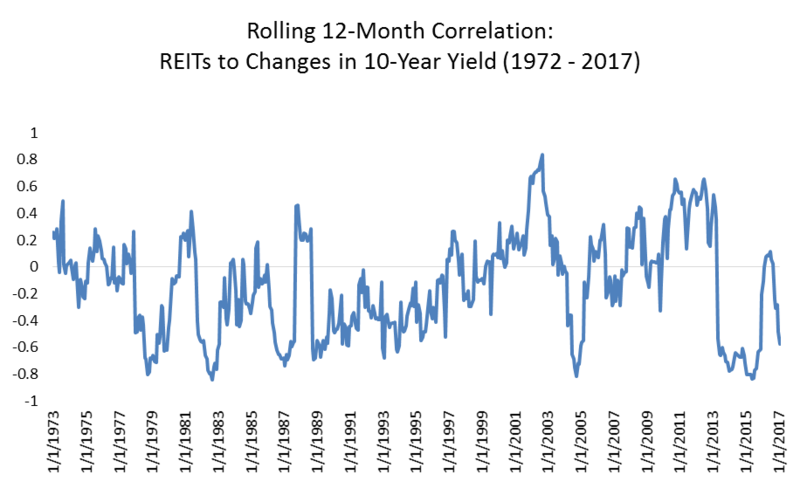 What the team measure is the correlation between the monthly returns of REITs and the 10 year Government Bond rate changes. 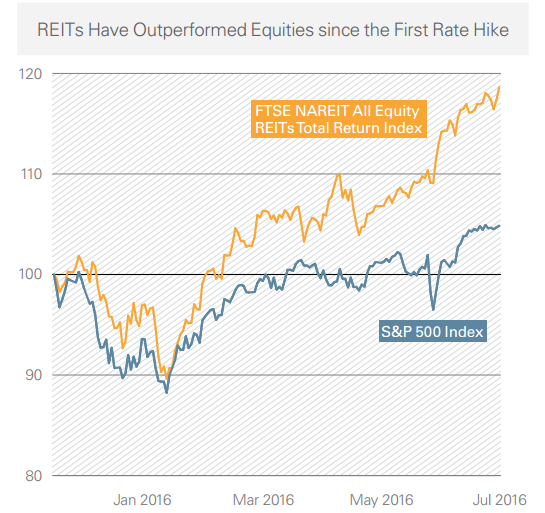 If interest rate change have a very strong impact on REIT’s returns, then we should see some very strong correlation. From the data above, the correlation is on average -0.08. This means there is very little correlation. It becomes very haphazard to predict the relationship between interest rate changes and short term REIT performance. Standard Life Investments also took a look at the correlation, but with the FTSE EPRA NAREIT, which is an index based on developed markets, emerging markets as well as the UK. 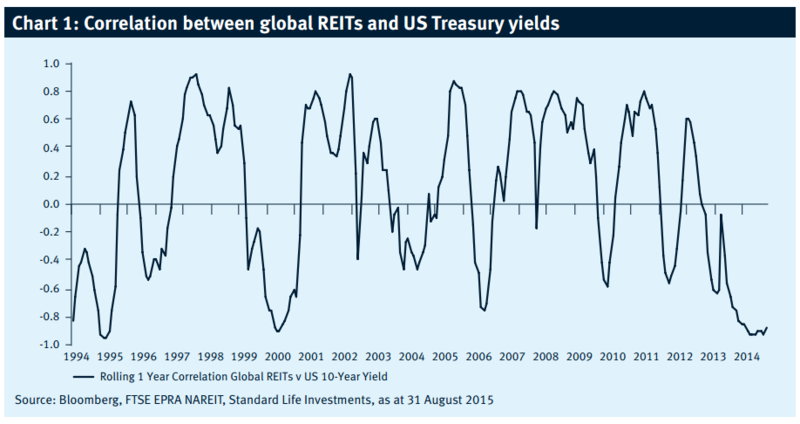 The correlations is not consistent over the period, but in recent times, we can see a clear inverse relationship between US Treasury Yields and Global REIT returns. The guys at Pension Partners provided some more interesting investigation. 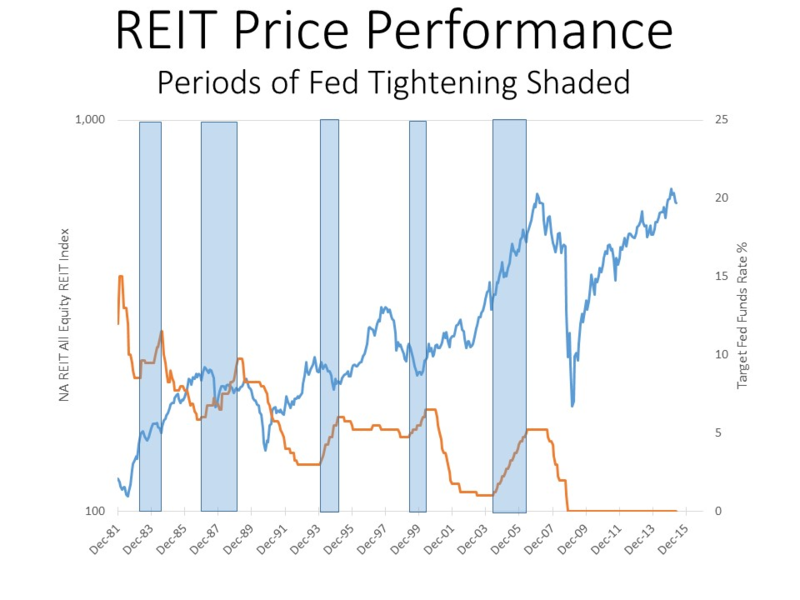 Rather than look at how rate increases will kill REITs, they zoom into a period where interest rate fell. If interest rate fall, the performance of REITs should be good. However, judging by this period in 2007 and 2008 where the 10 year government bond rates are down, the REIT index did the opposite. 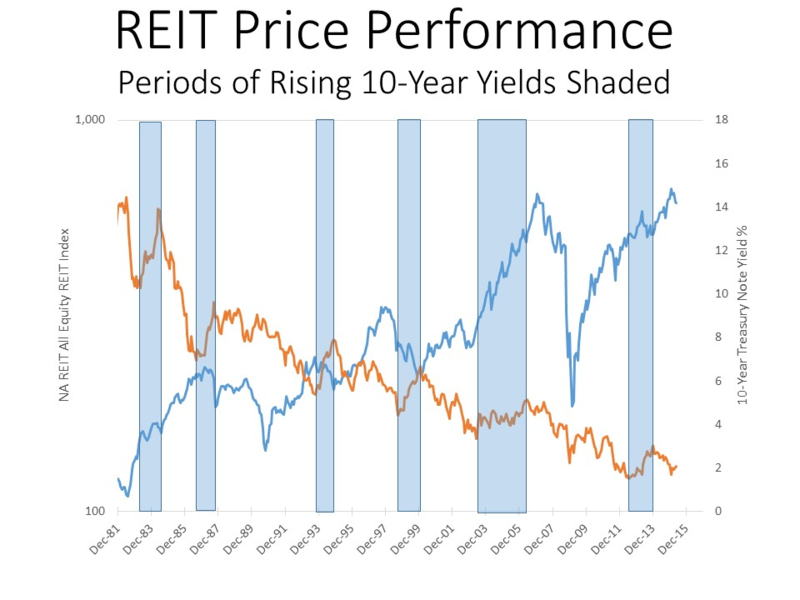 In 2009 when the 10 year government bond rates swing positively, the REIT index did better. Why is this? One of the main reason: There are more important factors at play. Particularly, the economy’s performance, demand and supply of properties and jobs seem to matter more in a period of recession which followed by a recovery. If we divide the performance of REIT and the broad based S&P 500 market over rising yield and falling yield, we will realize that both could return positive expected return. The relationship between rising interest rate and poorer REIT performance looks inconclusive. Since the massive rate hikes that ended in 1980, we have had almost 35 years of secular fall in interest rate. We have had 5 periods of tightening since 1981. In 3 of those periods, the REITs suffered. However, in the other 2 periods, the REITs actually did well. 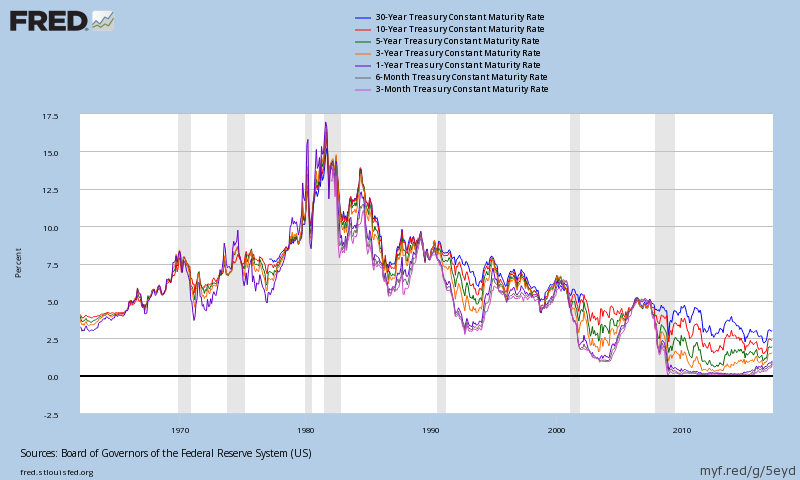 If we shift our attention from the short term government rates to the long term rates, there were 6 periods where the government bond rates was trending upwards. 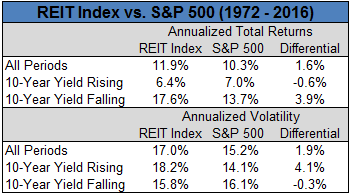 2 periods, the early 1980s and the mid 2000s, the REITs did well. However the other 4 periods REITs performed poorly. In Attractiveness of REIT as an investment asset versus alternative investments, we talked about the competing relationship between REITs and other asset class. If this were true, we should see a bigger yield premium between REITs and the 10 year government bond yield. Since government bond are more low risk than REITs, there should be a rather large premium. The above table shows that the average yield spread between REITs and 10 year government bond yields is between 0 to 2%. This is lower than many imagined. There was a few years where the REIT dividend yield is less than the government yield. This likely points to periods where the REITs were overvalued. Here is a different time frame but a more detail snapshot. With the limited data we have, CIMB in the past have tabulated 8 periods where the Singapore 10 year Government Bond Yields are rising. Only the period where the report came out does the FSTREI showed a negative performance in the face of rising long term government yields. However only 2 of the periods between 2004 to 2005 showed outperformance versus the MSCI Singapore index. Based on this, it does indicate a tendency for the REITs to underperform the index stocks during rising rate environment. Yet we might not be able to conclude a correlation between rising rates and negative future REIT performance. 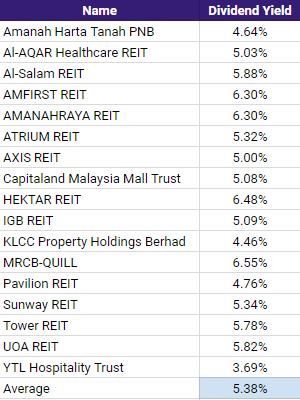 CIMB’s tabulation of the USA REIT situation shows the same inconclusive correlation between rising rates and future negative REIT performance. However, the underperformance in the same environment is consistent. 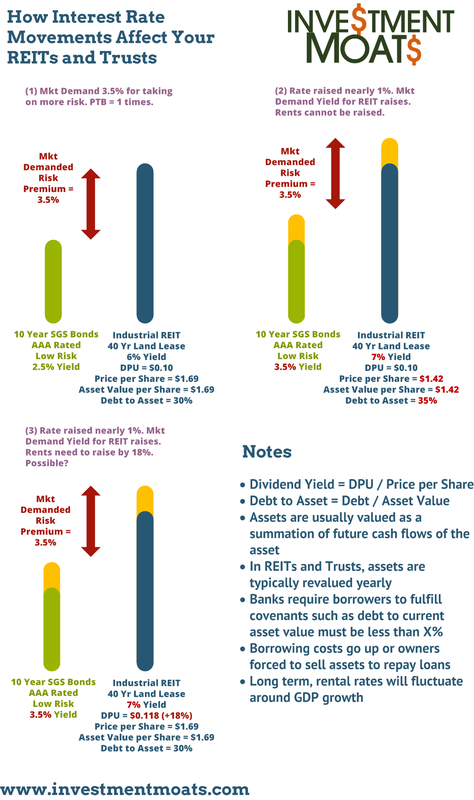 In our theoretical explanation that the Attractiveness of REIT as an investment asset versus Alternative Investments, we explain that there is a close relationship between the market dividend yield demanded by investors versus the alternative risk free rate. Would that work out in practice? We have already seen in previous examples the yield spread in USA over a long period hovers around a small range of 0 to 2%, with some periods of negative yield spread as a signed of overvalue. The M-REITs have been in a good run, and do not show the same weakness as the S-REITs. The yields have been compressed versus the government yields. And they have been largely not affected by the USA Rate Hikes. Government yields spiked from 3.6% to 4%. However the yield spread from this observation is between 1.78% to 1.38%. This is still a relatively thin spread. 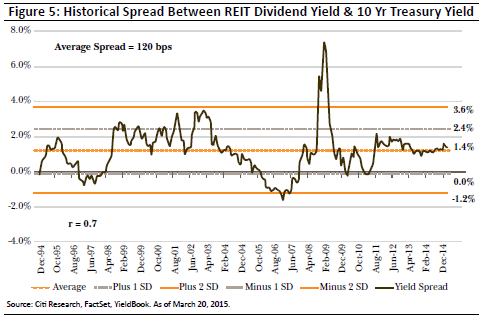 The Australian REITs showed a historical 2% yield spread. 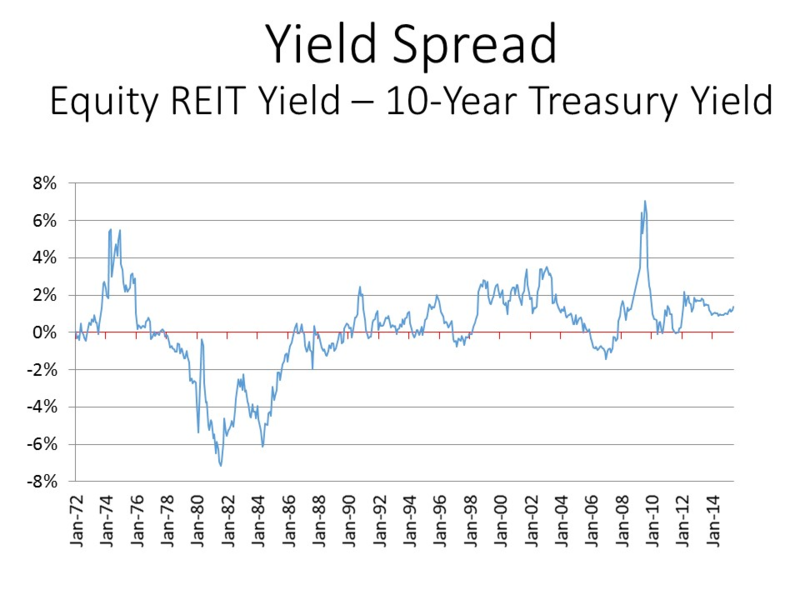 We can see again, a negative yield spread in end 2006 looks to be an indication of how overvalued the REITs were at that point. It should be noted that while REITs are sensitive to interest rate movements, they are not helpless in the face of interest rate changes. REITs are managed by managers and the managers do have a say in navigating REITs through different interest rate environments. Lazard Asset Management notes recently that investors are not focusing on the right metrics. Real estate demand is tied to overall economic growth. When rates rise, they are often based on an improving economy, suggesting that real estate demand will increase and net operating income will improve. The last rate high should have broken the REITs. However after a slight correction, REITs in the USA have performed well relative to the S&P 500. It helps that the real estate market in USA last year was still very conducive. Good managers have managed to secure loans at good interest rate. They will be able to rent out at a good spread to the fixed rate. Not all REITs are equally as sensitive to interest rate changes. This is similar to the sensitivity of bonds to interest rate changes based on their duration. A 2 year bond will likely change its price by 2% if there is an interest rate change of 1%. A 20 year bond will likely see its price changed by 15-20% if there is an interest rate change. REITs could possibly have such a property based on their weighted average lease expiry tenure. Some REITs like retail and commercial are short at 3 years while the industrial REITs are longer. Should there be a change in interest rate, the triple lease industrial REITs will see their price more affected. The hotel REITs react the best because their “rents” are set on a daily basis. The above table shows the different types of REITs. The right column shows which type are more sensitive to interest yields with Healthcare and Triple Net Lease REIT most sensitive to interest yield. The healthcare and Tripe Net Lease REIT have very long WALE and rental escalation.They should be the most susceptible to interest rate changes. But note: this is not always the case. The people who buys such long WALE REIT prioritize predictability of the returns over other factors. As such when interest rate rises, they might not sell off easily. We should be careful when analyzing things. Determine the buy and sell decision based on interest rate is not a good practice. REITs due to their leveraged nature, have a closer relationship with the cost of debt, compared to other assets. 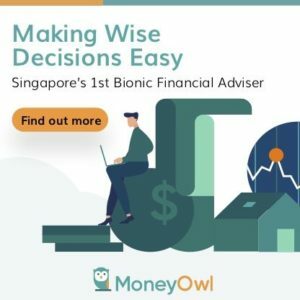 The data provided through the USA market, and the shorter Singapore market shows that the correlations between interest rate changes and REIT performance is not high. The simple idea is if cost of debt goes up from 3% to 5%, but when the supply of properties are limited such that existing properties command greater rent, then cash flow for distribution can go up as well. Interest rate rises is to rein in a country’s economy from overheating and perhaps only in late rate rises does it break the economic growth of a particular country. Thanks for the work. Again empirical evidence proves paper theory , general consensus and logical deduction not entirely true when dealing with the stock market. tks for sharing. you have been doing a great job! dividend investing is a marathon, many people don’t even want to start taking the first step when they see 42 km is so loooong. (the dividend is so little, how long is this going to take? )..however what I realized is that so long as I get started on the first step and just keep going and don’t give up halfway I will eventually reached the finish line. Anyway, I am still better than the other guy(a lot of people actually) who is still lamenting “how long is this gonna take?”..not yet started..
Just focus on the next km (1 lot of dividend stock, small steps) instead of keep thinking how many more km I need to go to reach 42 km(a person who thinks this way is likely to give up halfway). Just keep buying 1 lot at a time and before you know it, you are there!!! hi jason, looks like you are an old hand at this!